Oh, my goodness! Isn't this adorable??? It can be found at This Succulent Gift Shop. 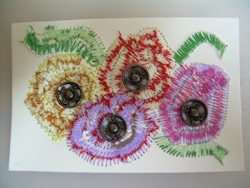 I am thinking about how to try and make one myself! I need to study how I could make the roof to hold the plants, and allow drainage. Sometimes I look at these things and just figure it might be better just to buy it already made...even though I am a DIY person. I just love this. 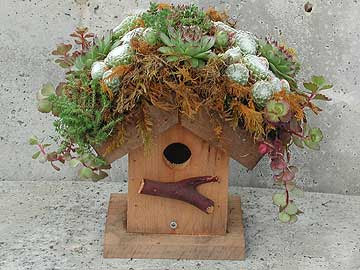 Has anyone ever made anything with a sedum or succulent roof before?? I sort of have an urge to just go around turning everyones roofs into succulent roofs! LOL...can you only imagine! The cost!!! I'd have to be a fairy godmother with a magic wand to pull this one off! What's new from the library! Over at Forever Young's place, you can find this really cool banner! I am a BIG reader, and I got the call today from my library that a book I had ordered had come in! Of course, I ran right over there after work, and picked it up! 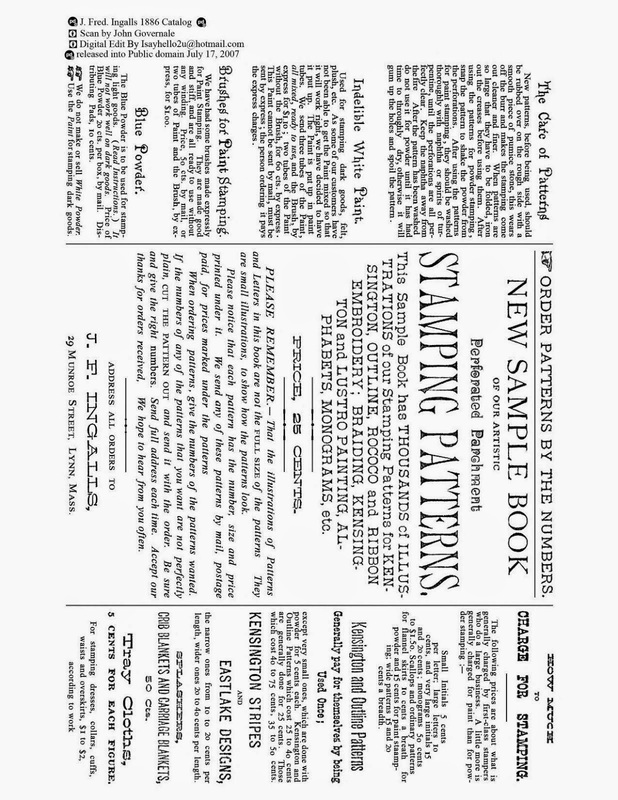 It is called The Great Encyclopedia Of Mushrooms, by Konemann. It is a huge book full of pictures! Now, don't you know I am just gonna be loving that this weekend when we go for a trip to the other side of Florida??? You know I will. 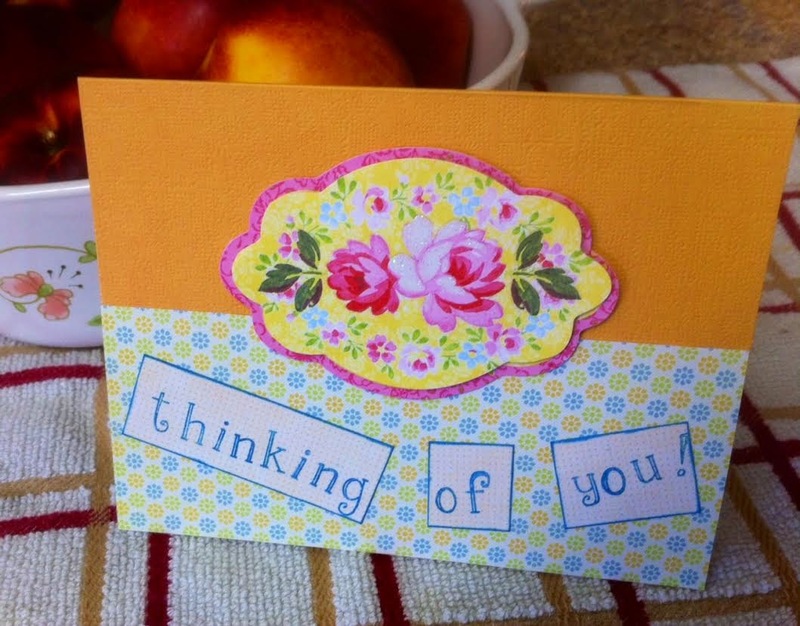 Be on the watch for any new ATC's at my other blog as I visit those places! Actually we leave Friday morning. It is a trip to celebrate my husbands birthday, and a little weekend trip before my daugher starts college! Allergies are a huge problem in Florida. 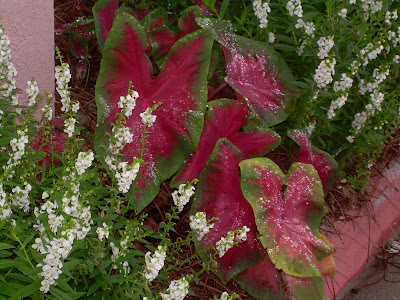 I see one of my favorite plants are a major culprit! Pine trees!!! Of course it makes perfect sense with all of the pollen they drop! I guess I won't be adding any to my yard! I really wanted to too! 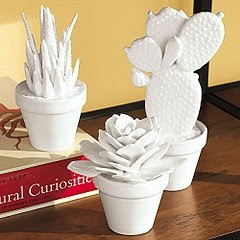 Porcelain Succulents!!! They are somewhat expensive, but are they not beautiful??? My new succulent areas, and plants! I am posting quite a few pics in this post! 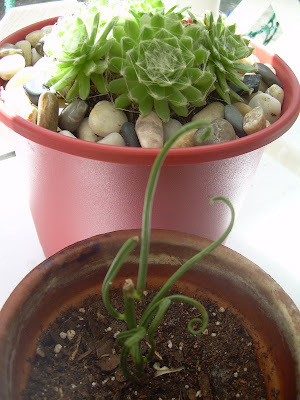 First, here are 2 mystery succulents that I have. I know I have posted them before, but I keep hoping someone will recognize one and tell me what it is!!! In the first one, what is is this thin, curly guy in front, and in the second pic....this is a ???????? A big mystery for me and others as well. You could be deemed a real genius if you can come up with it!!! LOL! Here are my new shelves in the screenroom, which house all of the plants that can't really take full sun. I bought two shelves that you put together, and they are supposed to be 4 shelves high, but I wanted to stop at 3 shelves high, so after I built two, I had two shelves left over for a 3rd shorter shelf. Whew...did that make sense??? LOL. Anyway, I think they turned out pretty well, and I can see them all with ease, and rotate them as needed also. Here are 3 of the ones that had to be moved out of the tires. Actually the Nelii here feels fine (firm), and has not gotten mushy, but I wanted to get it out of the rain sooner rather than later...oh...it just started raining again just now!!! This pretty Mexican Love Plant was losing it's bright pink color (areas are turning white), so wanted to get her out of full sun. My Flippin Flapjacks was affected the most, with loss of all of it's larger, beautiful leaves. I had to trim this guy up a bit, and bring him in. I think it was definately the rain that got the best of him...but I expect him to do fine now! Here are two of my pretty plants...(at least to me). The first is just a grafted moon cactus...but I love the color...and the second is my huernia! I think this is my number 1 weirdo plant! 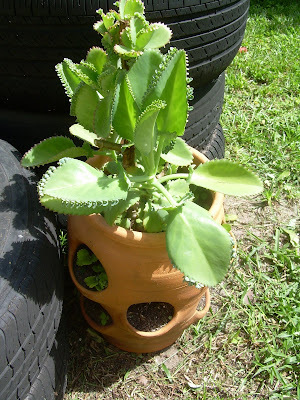 And last...here are my cleaned up and re-done succulent tires. Things had to be removed, and moved around, trimmed, and weeded. Most of the colored rocks had to be washed and replaced. I am happy with them again now that I spent the time needed to get them spruced up! This Stapeliad Gigantea was taking over this one tire, so I moved out 3 other smaller plants that shared with it, and just left all of the space for it. It spreads like a wild man, and I like it just looking so happy in here amidst the bright blue stones! I didn't have to worry about what to put in the side holes of this pot...the Mother of Thousands is dropping it's leaflets right into the pockets and should soon be full of new plantlets! And my pretty little Portulaca in the carport! She's so sweet! That ends the tour of all of my succulents, for now. Stay tuned for any future additions! 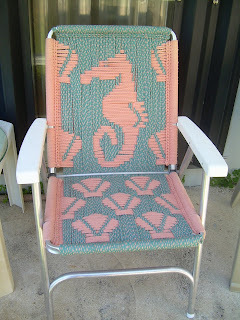 I found this chair at a garage sale yesterday! I could not resist it. The colors used are the old south Florida color scheme that everything seemed to go to years ago...thankfully that is changing!!! 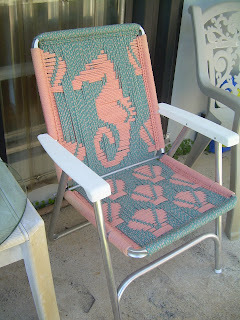 I want to copy the pattern and make macrame chairs like this is in all different colors! LOL. I think it would be fun to make them and sell on ebay! Hopefully I could order new aluminum chair frames online and get them shipped to my door! I gave this chair to my Mom, but if she doesn't like it so much, I will put it out in my succulent room (my screenroom)! LOL. I didn't have the heart to move all my succulents out of the tires. When I actually got out there and had a close-up look, most of them were OK. I needed to weed, and move a few things around. I did take out 4 plants, and repot into little pots and into the screenroom they went. I also moved all of the succulents I had on my front porch, to the new shelves in the screenroom, so they are all filled in now, and that area looks nice. I cleaned all areas and got them looking as ship-shape as possible for today. So...the succulent tire garden survived. I will take pictures of them, and my new shelves in the morning and post so you can see. You know, I never thought of my love for succulents as a hobby before. In my new Journals that I recieve from the Cactus and Succulent Society, they talk many times about their "hobbies". I like that idea...I suppose it really is that. I like the collecting part, the learning and researching part, and the sharing of information. I would love to travel some time to one of the conventions they have all around the country. So far, I haven't seen any listed in Florida. Of course, I would LOVE to fly to Arizona for one!!! They also have a seed depot, and you can order exotic seeds online for only 50 cents (if you are a memeber). If you are not a member they cost $2.50. That is a really neat service...because of the difficulty in finding your exotic plants, at times, and if ever! If anyone wants more information, and to recieve not one, but two monthly journals with tons of information and pictures, and fun stories of people traveling all over the world looking for succulents, then consider subscribing to the Cactus and Succulent Society. Help I.D. this cactus, pleaseee!!! 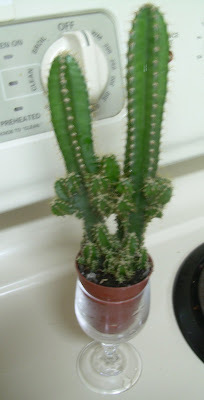 Can anyone tell me the name of this cactus? I got it at WALMART tonight, and it is sitting in a teeny-tiny pot (about the smallest I've ever seen...about 1 inch round I suppose). It is about 6.5 inches tall. Isn't it just so cute? I am going to leave it in my kitchen window to see it every day! I haven't had too many cactus, but have been intrigued by all the beautiful flowers my fellow bloggers have had, so...when I saw this cute little thing, I said "Why not"! My problem now is that I don't own any cactus I.D. books. LOL. I knew this would happen one day! I bought a couple of shelves at Walmart and I believe I have made a decision to move all of the plants that are in my tires, into the screenroom. Sadly, we have been getting too much rain all summer, and things are starting to look kinda poor. There are several plants that I have to get moved tomorrow, and I hope to have them all out by end of Sunday. I will stack the tires in a new fashion to plant flowers that can actually make it outside, this fall. Gonna move them to a little corner of the yard, so I can get my actual lawn back into shape since the several year drought killed areas of it. I am so proud to say my daughter recieved the Bright Futures Scholarship for college. Her education will be paid for 100%!!! I am so happy for her. You know, I was looking around last night at all of the scholarships that are out there and available to everyone. It is incredible. I even found one for me! LOL. Seriously, it was for a returning student, for certifications in horticulture, and was good at a community college or 4 year university! I am looking into possibly starting my certification process in January. Down here I want to do all of my classes that require actual outside work, to be in the coolest part of the year. I am so excited, because it is part of my retirement strategy...a career change when I move to part time work. Something different and beautiful...working with plants! Anyway...back to my daughter...she is a peach to have worked so hard and gotten straight A's (although we did not expect her to do that...she was just driven that way). I think I will take her out for ice cream tonight to celebrate! to see it. Turn on your volume! Turns it into a little sci-fi adventure! If it starts and stops as you watch it the first time, when it finishes, watch it again, and it will flow smoothly! After seeing a couple of these time-lapsed photography videos of mushrooms growing, I understand now why I am fascinated with them! ENJOY! I was sitting here this morning before heading out to work, reading my July-August Cactus and Succulent Journal, and I came across an article with information about the hybrid Euphorbia Milii, sometimes referred to as a Thai Crown of Thorns. The flowers are larger on these. It's funny, but when I bought my recent plant at Home Depot, I only thought "Wow, this is so beautiful", not even realizing how large the flowers were, until Aiyana mentioned it! I'm a little slow. I didn't even stop to say, "Hey, I'm not normally attracted to those thorny, thin stalked, tiny flowered buggers, but hey...look at this cool one"!!! LOL. Anyway, today at Wanapluk, I found out a little more information! Click on their name to read the article! Well, today I found myself walking through the college gardens again, and paying particular attention to the succulents there. I noted that the gardens are under cared for right now. I suppose it may just be due to the hot temperatures and no one wants to be out there. I wonder how they can even attempt to keep all of the pine needles cleared off the plants. I had been looking at my Stapelia gigantea wondering when it would bloom again for me for the second time, and I found the mother plant (the one my peice originally came from) here, with buds! How exciting. I will try and get back over to get some good close ups of the carrion flowers when they open (I HOPE)! Enjoy the tour of the garden! ?????? ?---anybody know this one below??? Agave of some sort?? Is it a young Americano marginata or variety of augustifolia??? I love the dramatic coloring, and white teeth margins! 3 shots of the beautiful opuntia!!! My daughter and I went to see the movie this afternoon, and what a wonderful, fun, movie for a mom and daughter to see together. It does have some sexual inuendo, so I don't think I would have been comfortable with someone under age 15 or so seeing it. I know I am a prude.....but this movie was JUST GREAT!!! I highly recommend it. The theater was packed, and they were running it in 3 seperate theaters out of 16. 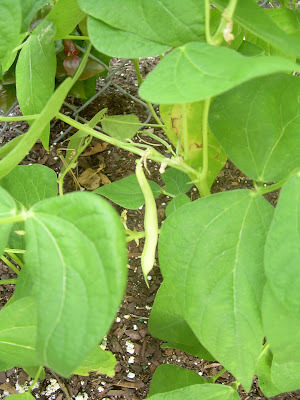 Well, I ran outside as soon as I read Tooties comment about my beans, and I immediately applied Miracle Gro! I am in shock...I suddenly (2 days later) have 8 more beans and loads of flowers! OMG!!! Yeeeeeee...I am so happy! Thanks for all of ya'lls comments! So supportive! You guys are awesome! I will let you know what else happens! I think I will do the fertilization weekly since we are having rain nearly every evening lately! I think Tootsie fertilizes every Friday anyway...correct me if I am wrong Tootsie! I am so excited that I might actually get enough for a meal for 3! Ha!!! I washed off my first 6 and put them in a "green bag" in the fridge, while waiting for further additions! Wish me luck with this big adventure! LOL. I've got 6 yellow beans!!! Ha ha ha! It is probably the first 6, and the last 6 as well! I planted just way too late!!! Oh well...come October 15, I will be ready to blast out my yard with my Cleomes, my red and white zinnias, some tomatoes, green beans, and maybe some more broccoli ( I had planted it last spring, but I want MORE)! I was reading somewhere about planting potatoes (which I won't), and the use of old tires to protect them from the wind. I guess you keep adding another tire each time your plant grows up too high and filling that tire with soil, until you have added a total of 3 tires. Interesting. Sometimes I get an urge to move all my succulents and use my tires for other gardening ideas, but then I talk myself out of it. Mostly because I am lazy, and also because I like my unique little succulent gardens! LOL. Today I stayed busy with tooth cleaning and my routine MD visit. In between I had lunch with my Mom and daughter. We were excited because our Jewish Deli had cabbage soup today! Normally they only serve it on Wednesdays, but I think so many people LOVE it, they do it more days now! Yeah for us, because we didn't get to go yesterday. It was grand. It has beef in it (I know...not vegetarian), but still a very light lunch, with only about 4 chunks of beef in all. This evening I get busy and decided to sort of make a prototype for a Halloween ATC, which you can find on my ATC BLOG. I know, it is like Halloween in July, but last evening it got so COOL outside following a rain, that I had a heavy urge to make fall crafts! EEEEEEEE! OK...I decided to add more embellishments...I was scarce in this department...something I think you have to plan out and buy what you need for it...but using what I already had, here is what I came up with! Since this is my first one, I decided I would never give her away, and that it would be safe to name her after myself...someone who is never perfect, but always working to sort of hang in there, all the time...She has my butterfly and flowers prsonality also! LOL. This is an example of really poor crafting!!! My first attmept at making a Dotee Doll. This is something people make and do "swaps" with others with. This thing is not worthy of being traded with anyone, but I will keep it to make a better pattern next time, make a better face, body, and need to come up with some great embellishments, which I may still try and dress this one up a bit. If I do, I will re-post. Instead of just using cut felt to do the face on, I used an oval shaped peice of fabric, and cut slits to the folding line to ease it as I turned and ironed the edges over, and then I hand sewed it on to give it a handmade feel (IT HAS THAT, for sure!!!) I used the sewing maching to sew the body for more durability...but now I wonder why, since I obviously won't want to be reminded of this crappy job for too long!!! LOL. I need tutorials. I thought it would be so easy!!! 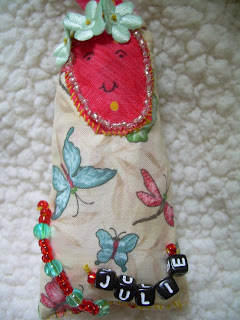 If you look closely, you can see a bit of gap between the fabric and the top bead at base of doll. This is just so weak!!! Lame!!! OMG...and I thought I could just snap this right together and it would be "perfection on a stick". This is just one example of ways I could, and probably will, find to keep myself occupied all summer. 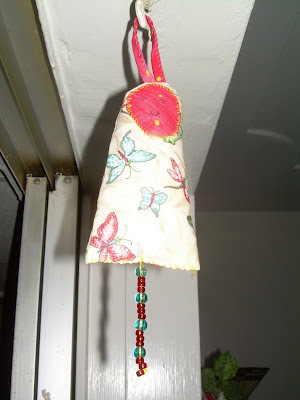 I am hoping maybe some other of you really good crafters, (and you know who you are), will join me in learning how to make Dotee dolls...do a Google search to see how, and check out some of the examples! 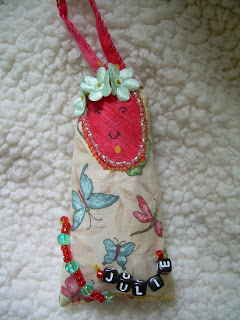 They are really cute...provided you find a great crafter to swap with...and that definately would NOT be me! At least not yet!!! While the cats away, I'm supposed to sleep????? NO! Here I am just a few days home from vacation and I am just wanting to be a bum! Sleeping a lot, like I have some strange form of sleeping sickness. I have all these ideas for actually planting things out in the brutal heat, and then I say, "Oh, forget about it"! I am really looking forward to fall when we can actually go outside and ENJOY it! LOL. I have come to realize how much I like white flowers with a bright red, orange or pink with it! This picture demonstrates how absolutely stunning the combination can be! I found these planted outside our hotel in Tipton, Ga., and had to take a picture. I think Tootsie will really love these, for some reason, as well as most all the rest of you fellow bloggers!!! 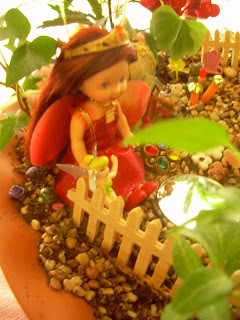 Tootsie is a flower girl though, and her blog shows that. I have never been much of a flower person, but I have to admit that if the plants that produce the flowers do not need ME to keep them alive, I feel I can manage to have a few flowers! 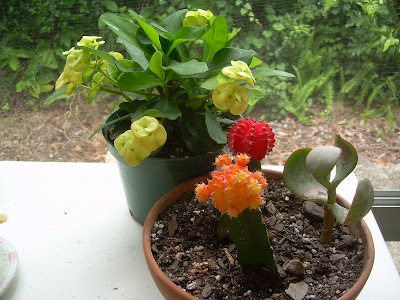 The thing that has made this clear to me is the fact that I sat that pot of white blooming crown of thorns next to 2 very bright and colorful moon cactus outside in my screenroom, where I see them everytime I look out there...and I realized I REALLY LIKED THE WHITE NEXT TO THE COLOR. My thoughts started racing to how could I get this outside without the use of water. Well...I mentioned it to my Mom (the sheer genius, truthfully, she is)...and she said, "Well, I have some white periwinkles you can have"! 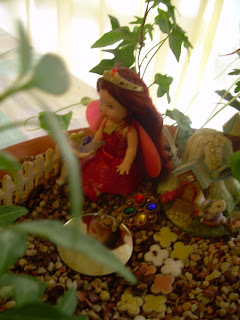 I looked outside along my fence which is lined with all green bushes, and envisioned the white periwinkles and in front some red and pink crown of thorns! I LOVE this idea. BUT...do you think I can get out there and do the work in this heat? Maybe in the evening I can. I do want to have something to show when my husband returns from visiting his family in Shreveport, LA. He is gone a week, and while the cats away, I am supposed to play...but all I want to do is sit in air conditioning!!! This is sad. All I can think is that I must be getting to old to hardly function anymore! LOL. I went over to Moms for the first time today after getting home from our little trip, and found this large pot of portulaca, or purslane in full bloom, and just mounded up so gorgeously! The flowers grow at the ends of the stems. and they come in an array of bright, beautiful colors; purple, scarlet, yellow and pink are just a few. 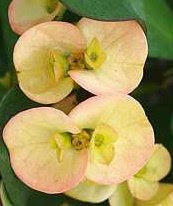 There are both single- and double-flowered varieties. I stole a picture when Mom wasn't looking! LOL. I love this hot pink variety of bloom. AND...I had forgotten all about this Crown of Thorns, or Euphorbia milii I bought the day before I left...which I found still covered with these pretty white-green flowers. I really like this color just because it is so odd to see (I think) as opposed to the red or pink blooms. E. milii has flowers that are small, subtended by a pair of conspicuous petal-like bracts, variably red, pink or white, up to 12 mm wide. better fruit and fairer flowers from the bounty of this earth." 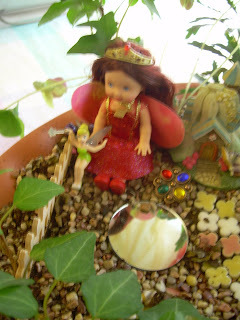 I found this giant fairy (by comparison) sitting in the midst of my fairy garden this afternoon. Tink was there and did not seem to be frightened by her size at all, and as a matter of fact they were sitting, chatting, and looked like old long-lost friends! How sweet! Glad I was able to get a few pictures before they flew away! No pictures kind of day! I was tortured at Stone Mountain! A huge enchanting sunflower field! Not a succulent, but maybe should be!